Exposure to toxic metals and persistent organic pollutants (POPs) remains a public health issue of serious concern, according to a new report entitled "Human biomonitoring: facts and figures", which will be presented at the WHO mid-term review of the European Environment and Health Process in Haifa, Israel, on 28–30 April 2015. The report reveals that substantial numbers of children and women of childbearing age in countries of the WHO European Region are exposed to pollutants at levels that can cause adverse health effects. Human biomonitoring (HBM) measures levels of pollutants in the human body – including from blood, urine, hair and breast milk – reflecting exposures through various pathways. Early-life exposure to mercury and lead can affect neurological development. While exposure to most POPs has declined steadily, their presence in breast milk remains an issue of concern owing to their potential endocrine-disrupting properties. 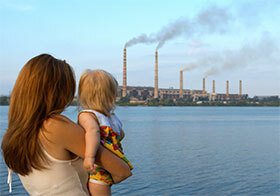 The benefits of breastfeeding, however, outweigh the risks of exposure to pollutants. More than 140 000 registered chemicals are in use in Europe. HBM studies highlight the importance of monitoring exposure to chemicals, especially among the most vulnerable groups, in order to inform and guide policy-makers in developing protective measures. Exposure to pollutants varies substantially across the Region. Higher levels of exposure to DDT (dichlorodiphenyltrichloroethane) and phthalates were found in lower-income countries, while exposure to mercury is higher in countries with high fish consumption. The report identifies concerns about the lack of HBM data that can be used effectively for policy development and monitoring. "This is truly an international issue," explains Dr Dorota Jarosinska, Programme Manager for Environmental Exposures and Risks at WHO/Europe. "Some pollutants, such as mercury and POPs, can travel long distances in the atmosphere and cross international borders. People could be affected, for example, through eating fish that have been contaminated by pollutants released on the other side of the world. This is why internationally coordinated action is essential." use HBM data in conjunction with emissions, lifestyle or nutrition data to identify sources of exposures, assess health risks and design evidence-based interventions to protect health.